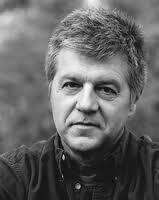 Robert Wrigley’s books include Earthly Meditations (Penguin, 2006) Beautiful Country (Penguin, 2010) and Anatomy of Melancholy and Other Poems, forthcoming from Penguin in the spring of 2013. His awards include a Guggenheim Foundation Fellowship and the Kingsley Tufts Award. He teaches in the MFA program at the University of Idaho. “Prey” was first published in Shenandoah 46/3. that is, over the other. One brushes an ant from one’s ear. one admits.) Thinking one dead, a deer approaches. and run. If only one could run as a deer does. a ways, beguiled by the wave of its white tail. But no, one is molten. One seems to have no bones. One shall not run, not now, nor even rise. and by the sun through the needles of the trees be dappled. Though of course one should avoid the word dappled. in his poem and sees one’s borrowing as praise. and one decides one’s praise is for him instead, the poet. upon one’s back in the woods is not wasted after all. although one wishes one had known her when she was young. the too-soon dead, the chaste and priestly poets of yore. Otherwise, one does not imagine one is certain of much. on the limb directly above, a rabbit in its talons. will soon be dappled with the rabbit’s blood. to see one’s bloody face and shirt. One is fairly speechless at the beauty of this one, Bob. I heard Robert read this in Atlanta last year and enjoyed it very much. I’m happy to have found it here so that I can study it more closely: the humor, the cleverness (but not merely clever to be clever), the unusual scene of hawk and rabbit, the way the poem unfolds, etc.